Each problem (tsumego) in the book gets only one solution diagram. The introduction states that it is up to the reader to verify that the solution presented is the best solution to each problem. There are some times for people solving this book to estimate its grade at the Problem Book Grades page. Several of the problems in the book are based upon bent four in the corner. Dieter: I'm a fond lover of tsumego, and thus this book with 1001 problems is a sweet treasure. The level of the first move problems is rather low: I (1 Dan) did a bit more than one hour over the first 140 problems in two intervals - waiting in a queue, so not really trying to break my record. So it's fair to say that they take me less than 20 seconds to solve, subtracting the time used for flipping pages and verifying the answers. I got three wrong out of 140. I like this: it is fast food for the brain. I do have one severe criticism of the book. The solution diagrams are accompanied by two lines of comments that are mere variations on the theme "After Black 1, there is no way for White to kill". 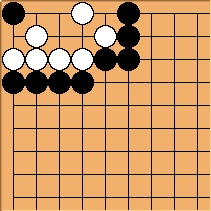 Only very occasionally avoiding ko is mentioned and exceptionally a wrong first move is indicated. I have nothing against solution diagrams without comments: I rely on the knowledge of the Nihon Ki-in (in this case). But if the writers do add comments, they should be worthwhile. Stefan: Not to imply that your criticism isn't valid, but to be fair to the author he does warn the reader in the Preface. In order to include so many problems in a limited number of pages, the explanations are minimal. The reader should make the effort to verify that the answer to each problem is indeed the best and most profitable and to prove to himself that any other move fails to achieve the stated objective. This effort is also part of the practice that these problems provide. And about the 'avoiding ko' point: in all problems, Black must either live unconditionally or kill White unconditionally. That is, an answer that leads to a ko is a failure unless Black can live or kill by creating a double ko. Velobici: The level of the first move problems must be below 1 Dan... I can solve them and I am no 1 Dan. I would estimate them as being 10 kyu to 5 kyu. The last 200 problems, Five moves problems, Black to kill, are considerably more difficult than the first 801. This fits in with Kato Masao's statement in Attack and Kill that killing is considerably harder than living. Hagger? : I´m only a 15 kyu player, but I´ve seen the solution of about 20 % of the Problems immediately. Others are tricky and I´m almost always trapped by sidesolutions involving Ko´s. With the help of Gnugo/GoGui this book is very useful for double Kyos too. I like it. I think the difficulty is not higher then "Graded Go Problems for Beginners III and IV"
Weiss I concur that the moves are of low level, (Velobici, he means they are indeed low, he stated he is 1d and did many in a short time, not that the problems are 1d, if I am correct Dieter.) but excellent for quick basics. The 3 move problems inspire reading ahead, and I definitely value this book for reading after the Graded Go Problem series. Tderz: I agree with Dieter's comment's on the shortness of the comments. Even if the introduction might warn about the shortness, the numerous After Black connects/captures/etc. at 1 his stones are alive. are simply superflous when the problem titles indicated already Black to live, resp. Black to kill. The space could have been better used to comment on a wrong path instead. I got this problem book as a wrong delivery instead of 501 Opening Problems. While I (3dan) didn't buy it in the shop, because I thought the problems were too easy, I liked it very much in the end when I went through all problems. Not for nothing the Kansai Kiin's professional advice is Do study tsume go, everyday and also repeat many easy problems very often. At the end I was astonished to have made many (small and grave) errors. I also count as wrong, if my first move is correct, but I did not see white's strongest response. In a real game it might still work out, but it indicates a lack. Also I discovered many of those small errors of the book itself. While going through all of the problems (In 6 weeks, because I'm a busy father of two) I realized that an index is missing as in the 'Igo Hatsuyoron', so I made one for myself. Being critical about my own errors, underlining slight errors once (living too small) and giving up during a problem and failures twice. It's revealing to discover blind spots, like having only 4 options for a move and the correct one is first a connecting move. First I was convinced that there are several doubles in the book, but there are just many similar positions and it's very teaching why their respective solutions are dis-similar. Altogether I am very happy that I went through the book and can only recommend it very much (cf. Kansai Kiin's advice). Richard Hunter: This book is virtually 100% based on New Igo bessatsu #28. I was the one who recommended it to Richard, having read the Japanese book twice and loved it. In the Japanese book, the first 400 problems have no comments, only a single word naming the one-move answer. I rather liked that, but Richard decided to add move explanation for English readers. Imagist: I love this book because it covers a lot of different kinds of basic killing/living moves. Most problem sets focus on shapes rather than the concepts behind the shapes. I think it would be easy enough to get all the way through the elementary section of Cho Chikun's Encyclopedia of life and death without being good at spotting double threats, shortage of liberties, etc., although that collection does prepare one for shapes that are likely to come up in games. On the other hand, 1001 Life and Death Problems has odd and sometimes even contrived shapes, but they demonstrate the concepts of life and death more effectively. This is particularly useful for finding blind spots to a specific concept, such as my own weakness around shortage of liberties. Luis Sousa: I don't like how they organised the problems in this book, living only, then killing only... I think they should have alternated the problems, or at least the pages, between living and killing problems. I just starded reading this book, but after reaching problem 100, I am restarting by doing 1 page from the living part and then 1 page from the killing. On the 3 move problems, i'll do 2 living and 1 killing, on the 5 move problems, viceversa! According to original Japanese book. LSousa(kgs 2kyu): You need to be 6d to get 95% of the problems right? Maybe if you only have 10 seconds per problem?